Organizational development (OD) is an application of behavioral science to organizational change. It encompasses a wide array of theories, processes, and activities, all of which are oriented toward the goal of improving individual organizations. OD stresses carefully planned approaches to changing or improving organizational structures and processes, in an attempt to minimize negative side effects and maximize organizational effectiveness. OD differs from traditional organizational change techniques in that it typically embraces a more holistic approach that is aimed at transforming thought and behavior throughout an entity. Like many other organizational change techniques, the basic OD process consists of gathering data, planning changes, and then implementing and managing the changes. However, OD initiatives are usually distinguished by the use of "action research," change agents, and "interventions." Organization development is rooted in behavioral research that proliferated in the United States after World War II. That research led to the development in the late 1940s and 1950s of behavioral development strategies like sensitivity training, survey feedback, sociotechnical systems, and quality management. Chief among the early endeavors in the field of behavioral science were Kurt Lewin's contributions to sensitivity training, or T-groups, during the mid-1940s (Lewin was the director of the Research Center for Group Dynamics at the Massachusetts Institute of Technology). Lewin's research showed that informal discussions about individual and group behavior, when combined with feedback, were more educational for group members than were lectures and seminars. T-groups ("T" stands for training) became popular with several major corporations as a means of improving group performance. In fact, during the 1950s and 1960s, organizational change and development was often considered synonymous with sensitivity training. Also emerging in the mid-1940s were the behavioral techniques of survey research and feedback, many of which were originally developed by Rensis Likert and fellow researchers at the University of Michigan Survey Research Center. Likert and his associates used questionnaires, statistical samples, and feedback to managers to improve organizations. They found that when managers shared the information with subordinates and discussed potential routes to improvement, overall group performance was enhanced. Also of import to the evolution of OD were sociotechnical system models developed during the 1950s and originating from England's Tavistock Institute. These models were developed to help sustain meaningful social interaction and fulfill workers' social needs in the face of technological change. Such methods of responding to change were later adapted to help manage organizational turbulence caused by other factors, such as restructuring or layoffs, and to create more efficient management structures. In the context of modern OD, a sociotechnical system approach usually involves work teams. Although they weren't integrated into OD in the United States until the 1980s, quality management philosophies and processes were also formulated during the 1940s and 1950s. W. Edwards Deming and J.M. Juran are generally credited with developing continuous quality improvement techniques that they successfully implemented in many corporations. Both Deming and Juran achieved great success with their programs in Japan following World War II before returning to the United States to help American firms. Their contributions to OD have included statistical analysis techniques and methods for creating conditions of perpetual improvement in organizations. During the 1950s and 1960s, researchers and managers began to pull together different elements of the behavioral development strategies described above to create more comprehensive processes for planning and executing change in organizations. For example, Lewin (1951) devised a renowned three-step change process that entailed "unfreezing," changing, and then "refreezing" the behavior of individuals and groups within organizations. In fact, it was during the 1960s and 1970s that the term "organizational development" was popularized to describe a multidisciplinary approach to achieving organizational change and improvement. OD evolved during the 1970s and 1980s to encompass a variety of change techniques and processes. Interest in OD was bolstered in the United States during the 1980s by global and domestic economic influences. As domestic market growth slowed and foreign competition increased, many U.S. companies were forced to implement extensive changes in their organizations. For example, in their pursuit of quality and productivity, many corporations slashed payrolls, introduced new technology, adopted new management structures, and altered worker incentive systems. In an effort to effect change, many companies utilized OD techniques. Although the field of OD is broad, it can be differentiated from other systems of organizational change by its emphasis on process rather than problems. Indeed, traditional group change systems have focused on identifying problems in an organization and then trying to alter the behavior that creates the problem. OD initiatives, in contrast, focus on identifying the behavioral interactions and patterns that cause and sustain problems. Then, rather than simply changing isolated behaviors, OD efforts are aimed at creating a behaviorally healthy organization that will naturally anticipate and prevent (or quickly solve) problems. OD programs usually share several basic characteristics. For instance, they are considered long-term efforts of at least one to three years in most cases. In addition, OD stresses collaborative management, whereby managers and workers at different levels of the hierarchy cooperate to solve problems. OD also recognizes that every organization is unique and that the same solutions can't necessarily be applied at different companies—this assumption is reflected in an OD focus on research and feedback. Another common trait of OD programs is an emphasis on the value of teamwork and small groups. In fact, most OD systems implement broad organizational changes and overcome resistance largely through the efforts of small teams and/or individuals. An integral feature of most OD programs is the change agent, which is the group or individual that facilitates the OD process. Change agents are usually outside consultants with experience managing OD programs, although companies sometimes utilize inside managers. The advantage of bringing in outside OD consultants is that they often provide a different perspective and have a less biased view of the organization's problems and needs. The drawback of outside change agents-is that they typically lack an in-depth understanding of key issues particular to the company (or institution). In addition, outside consultants may have trouble securing the trust and cooperation of key players in the organization. For these reasons, some companies employ a externalinternal team approach, which combines the advantages of internal and external change agents. OD efforts basically entail two groups of activities; "action research" and "interventions." Action research was originated in the 1940s by Lewin and another U.S. researcher, John Collier. It is a process of systematically collecting data on a specific organization, feeding it back for action planning, and evaluating results by collecting and reflecting on more data. Data gathering techniques include everything from surveys and questionnaires to interviews, collages, drawings, and tests. The data is often evaluated and interpreted using advanced statistical analysis techniques. Action research can be thought of as the diagnostic component of the OD process. But it also encompasses the intervention component, whereby the change agent uses actions plans to intervene in the organization and make changes, as discussed below. In a continuous process, the results of actions are measured and evaluated and new action plans are devised to effect new changes. Thus, the intervention process can be considered a facet of action research. A standard action research model was posited by W.L. French in his essay "Organization Development: Objectives, Assumptions, and Strategies" in Sloan Management Review, (1969, Vol. XII, No. 2.). 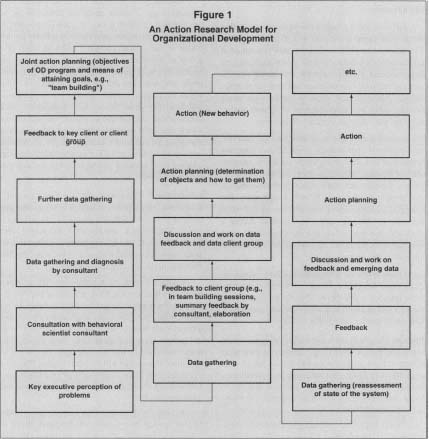 As shown in the chart, the first step in the OD process is recognition of a problem by key executives. Those managers then consult with a change agent (a group or individual), which gathers data, provides feedback to the executives, and then helps them determine change objectives. Next, the agent does new research within the context of the stated OD goals, gives more feedback, devises a plan of action, and then intervenes in the company to effect change. After (or during) the intervention(s), data is gathered, feedback is supplied, actions are planned and implemented, and the process is repeated. OD interventions are plans or programs comprised of specific activities designed to effect change in some facet of an organization. Numerous interventions have been developed over the years to address different problems or create various results. However, they all are geared toward the goal of improving the entire organization through change. In general, organizations that wish to achieve a high degree of organizational change will employ a full range of interventions, including those designed to transform individual and group behavior and attitudes. Entities attempting smaller changes will stop short of those goals, applying interventions targeted primarily toward operating policies, management structures, worker skills, and personnel policies. OD interventions can be categorized in a number of ways, including function, the type of group for which they are intended, or the industry to which they apply. In fact, W.L. French identified 13 major "families" of interventions based on the type of activities that they included—activity groups included teambuilding, survey feedback, structural change, and career-planning. One convenient method of classifying OD interventions is by group size and interrelationship, including: interpersonal relationships, group processes, intergroup systems, and the entire organization. Typically, an OD program will simultaneously integrate more than one of these interventions. A few of the more popular interventions are briefly described below. Interpersonal interventions in an OD program are designed to enhance individual skills, knowledge, and effectiveness. One of the most popular interventions in this class are T-groups, which help workers become more aware of their own and their coworker's behavior patterns. A typical T-group consists of 10 to 20 volunteers. They usually meet at a specific time for one or two weeks. The meetings are unstructured, leaving the group to determine subject matter within the context of basic goals stipulated by a facilitator. As group members try to exert structure on fellow members, anxiety ensues and the group becomes more aware of their own and other's feelings and behaviors. For example, a group of managers in a marketing department might participate in a T-group together. The members would then describe their perception of each member's behavior and the group might suggest improvements. Finally, each member would identify areas of personal improvement and then act to make changes. The end result would be that the team would become more proficient because of greater understanding and subsequent efforts to improve. A second example of an interpersonal intervention is process consultation, which helps a company understand and alter processes by resolving interpersonal dilemmas. Although they are similar to T-groups, process consultations are more task-oriented and involve greater input by the change agent. For example, a change agent may observe an individual manager in meetings and conversations during a workday, and then make specific suggestions as to how the manager could alter his or her behavior to improve performance. Other types of interpersonal interventions include those designed to improve the performance review process, create better training programs, help workers identify their true wants and set complementary career goals, and resolve conflict. Group diagnostic interventions are simply meetings wherein members of a team analyze their performance, ask questions about what they need to improve, and discuss potential solutions to problems. The benefit of such interventions is that members often communicate problems that their coworkers didn't know existed (or were perceived to exist). As a result, many problems are resolved and group dynamics are improved simply as a result of the meeting(s). Team-building meetings are similar to diagnostic interventions, but they usually involve getting the group away from the workplace for a few days. In addition, the group members go a step further than diagnosing problems by proposing, discussing, and evaluating solutions. The purpose of the meetings is to formulate specific procedures for addressing problems. The chief advantage of such interventions is that they help the team reach a consensus on solving problems (away from the pressures of the workplace), thus eliminating incongruent actions and goals that diminish the group's efficiency. Role analysis technique (RAT) is used to help employees get a better grasp on their role in an organization. In the first step of a RAT intervention, people define their perception of their role and contribution to the overall company effort in front of a group of coworkers. Group members then provide feedback to more clearly define the role. In the second phase, the individual and the group examine ways in which the employee relies on others in the company, and how they define his or her expectations. RAT interventions help people to reduce role confusion, which can result in either conflict or the perception that some people aren't doing their job. A popular intervention similar to RAT is responsibility charting, which utilizes a matrix system to assign decision and task responsibilities. Intergroup interventions are integrated into OD programs to facilitate cooperation and efficiency between different groups within an organization. For instance, departmental interaction often deteriorates in larger organizations as different divisions battle for limited resources or become detached from the needs of other departments. Conflict resolution meetings are one common intergroup intervention. First, different group leaders are brought together to get their commitment to the intervention. Next, the teams meet separately to make a list of their feelings about the other group(s). Then the groups meet and share their lists. Finally, the teams meet to discuss the problems and to try to develop solutions that will help both parties. This type of intervention helps to gradually diffuse tension between groups caused by lack of communication and misunderstanding. Rotating membership interventions are used by OD change agents to minimize the negative effects of intergroup rivalry that result from employee allegiances to groups or divisions. The intervention basically entails temporarily putting group members into their rival groups. As more people interact in the different groups, greater understanding results. OD joint activity interventions serve the same basic function as the rotating membership approach, but it involves getting members of different groups to work together toward a common goal. Similarly, common enemy interventions achieve the same results by finding an adversary common to two or more groups and then getting members of the groups to work together to overcome the threat. Examples of common enemies include competitors, government regulation, and economic conditions. OD comprehensive interventions are used to directly create change throughout an entire organization, rather than focusing on organizational change through subgroup interventions. One of the most popular comprehensive interventions is survey feedback. This technique basically entails surveying employee attitudes at all levels of the hierarchy and then reporting the findings back to them. The employees then use the data in feedback sessions to create solutions to perceived problems. A number of questionnaires developed specifically for such interventions have been developed. Structural change interventions are used by OD change agents to effect organizational alterations related to departmentalization, management hierarchy, work policies, compensation and benefit incentives programs, and other elements. Often, the implemented changes emanate from feedback from other interventions. One benefit of change interventions is that companies can often realize an immediate and very significant impact as a result of relatively minor modifications. Sociotechnical system design interventions are similar to structural change techniques, but they typically emphasize the reorganization of work teams. The basic goal is to create independent groups throughout the company that supervise themselves, including administering pay and benefits, disciplining team members, and monitoring quality, among other responsibilities. The theoretic benefit of sociotechnical system design interventions is that worker and group productivity and quality is increased because workers have more control over (and subsequent satisfaction from) the process in which they participate. A fourth OD intervention that became extremely popular during the 1980s and early 1990s is total quality management (TQM), which is largely a corollary of Deming's work. TQM interventions utilize established quality techniques and programs that emphasize quality processes, rather than achieving quality by inspecting products and services after processes have been completed. The important concept of continuous improvement embodied by TQM has carried over into other OD interventions. While TQM has lost some of its popularity since then, other OD trends and theories have come to the forefront since the early 1990s. One of the major new developments has been the notion of the "learning organization," oracontinuously adapting and growing organization that actively embraces its own evolution to develop new capabilities or competencies. A key impetus behind this new approach was the critically acclaimed 1990 book The Fifth Discipline: The Art and Practice of the Learning Organization by MIT organizational studies lecturer Peter Senge. While the academic study of organizational learning and related phenomena originated a couple decades earlier, this book did much to popularize the idea and stimulate a host of academic studies into organizational learning, as well as corporate initiatives geared toward building learning organizations. The basic analogy for organizational learning is, of course, human learning. Just as individuals can amass knowledge and skills through both deliberate attempts to acquire knowledge (reading, attending school) and inadvertent discoveries (experimentation, failure, insights from experiences), so too can groups of people, according to the theory. Clearly, the methods by which an organization "learns" are different from those of the individual, but the process is seen as similar. Various models of organizational learning posit key stages as knowledge acquisition, knowledge sharing, and knowledge utilization as the core mechanisms of this collective learning process. The specific kind of learning that this discipline is concerned with is on a fundamental, organizationwide level. OD scholars distinguish between singleloop learning, double-loop learning, and triple-loop learning. Single-loop learning, the most common, is in essence localized learning within departments or subunits of the organization, but has few if any implications for the entire company. Policies and rules remain unchanged. This kind of learning goes on in virtually all organizations and isn't sufficient to create what most OD specialists would term a learning organization. Double-loop learning occurs when a discovery or insight causes not only localized change, but a general revision in corporate policy or strategy that takes into account this new insight. Triple-loop learning goes one step further, causing management to rethink the entire business paradigm and make major organizational changes based on the new insight. Proponents of organizational iearning focus on ways to create organizational structures, processes, and policies that encourage second- and third-loop learning. While in some ways organizational learning has taken on some of the trappings of a management fad, its disciples, including Senge, bristle at this suggestion because they believe it's an enduring and valuable principle for understanding and influencing organizational development. A less widely known innovation that also garnered attention in the field during the 1990s was appreciative inquiry, developed by organizational behavior professor David Cooperrider. First conceived during the 1980s, the approach centers around examining organizational practices that have proven successful as a way of addressing broad-based development issues. Cooperrider believed that traditional OD approaches focused too much on hunting down problems and looking for new solutions, whereas many organizations have numerous successes or strengths that might hold a better key to an organization's development. Appreciative inquiry is still an interventionist approach to OD, but its emphasis is on discovering and identifying current strengths and envisioning a positive future building on those strengths. Appreciative inquiry also places marked emphasis on the human experience in organizational development, asking employees to recount their best experiences in the organization and imagine new possibilities. Usually this approach is reserved for large, company-wide development issues, including redefining the corporate mission and strategy. Critics of appreciative inquiry charge that it's too simplistic to be used in very many contexts. Many advocates also agree that it is a supplement to, rather than a replacement of, established OD theories and practices. A classic example of how OD can change an organization for the better is the initiative undertaken by General Motors Corp. at its Tarrytown, New York, auto assembly plant in the 1970s. By the late 1960s, Tarrytown had earned a reputation as one the least productive plants in the company. Labor relations and quality were at an all-time low, and absenteeism was rampant, when GM finally decided to take action. Realizing the seriousness of the situation, plant managers tried something new—they sought direct input from laborers about all aspects of the plant operations. Then they began to implement the ideas with success, sparking interest in a more comprehensive OD effort. Thus, in the early 1970s, GM initiated a quality-of-work-life (QWL) program, an OD program that integrates several types of interventions. The goal of QWLs is to improve organizational efficiency through employee well-being and participative decision-making. In 1973, the union leaders signed a "letter of agreement" with management in which both groups agreed to commit themselves to exploring specific OD initiatives that could improve the plant. The plant hired an outside consultant to oversee the change process. The initial research stage included a series of problem-solving training sessions, during which 34 workers from two shifts would meet for eight hours on Saturdays. Those meetings succeeded in helping plant managers to improve productivity. Therefore, in 1977 management increased the scope of the OD program by launching a plantwide effort that included 3,800 managers and laborers. Although the OD program eventually cost GM more than $1.5 million, it paid off in the long run through greater productivity, higher quality, and improved labor relations. For example, the number of pending grievances plummeted from 2,000 in 1972 to only 32 by 1978. Absenteeism dropped as well, from more than seven percent to less than three percent. In fact, by the late 1970s the Tarrytown plant was recognized as one of the most productive and best run in the entire GM organization. French, Wendell L., and Cecil H. Bell. Organizational Development: Behavioral Science Interventions for Organization. 5th ed. Englewood Cliffs, NJ: Prentice Hall, 1994. Fulmer, Robert M., and J. Bernard Keys. "A Conversation with Peter Senge: New Developments in Organizational Learning." Organizational Dynamics, autumn 1998. Ivancevich, John M., and Michael T. Matteson. Organizational Behavior and Management. 5th ed. New York: McGraw-Hill, 1998. Robbins, Stephen P. Organizational Behavior: Concepts, Controversies, and Applications. 8th ed. Upper Saddle River, NJ: Prentice Hall, 1998. Zemke, Ron. "Don't Fix That Company!" Training, June 1999.